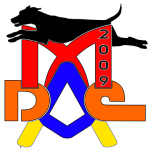 Reminder: The Midwest Agility Championships will be held On October 23-25, 2009 at a new site with indoor sports turf, the Libertyville Sports Complex, Liberty, IL. Closing date for entries is September 26th. Here's a link to the premium. Looks like 'recreational' dog agility is the latest business venture to be franchised. The Zoom Room announced today their launch of the Nation's first dog agility franchise opportunity. Read more. Our friends Tani (8 month old Pyr) and Barbie with some fun tricks for puppies! Fun vid - teaching your pup to walk on your feet from Sian! Here is a nice little playlist to help teach your dog how to lift back legs, right legs, and weave backwards, from Polona! A great video - teaching your dog to tug from KiKopup! This would be so much fun! Cosi did an agility demo at their local fair and they set up an agility race between two dogs at the same time. I wanna try that!!!! Check out our latest article for Dog Sport Magazine - Greening the Doo! How you can take care of your dog's poo and keep earth friendly at the same time. ESPN will broadcast the Purina Incredible Dog Challenge Eastern Regionals on Sun, September 20, 5pm – 6pm. Check your local listings for any changes. A new series from Animal Planet will kick off on Saturday, October 3, at 8 PM (ET/PT). Featuring Zak George of YouTube fame the series, SuperFetch, will focus on Zak and his proteges, as he works with pet parents showing them how to transform their ordinary pet into a trick-doing stunt jockey and in the process strengthens the bond they have with their beloved companion. Should be fun! The new HBO Films movie, based on Jon Katz book, "A Dog Year" will premiere tomorrow night, 8 PM on HBO, starring Jeff Bridges. Last night we learned of yet another gut wrenching loss to the agility community. Our hearts go out to the families of Focus and Bailey as they try and cope with the passing of their amazing agility teammates.